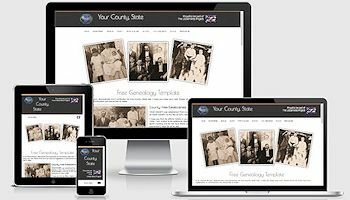 Almost Free Website Template - Free for Genealogy sites! You are welcome to use it for your site. You must maintain our credit link on all pages. If you purchase the template at the usual price of $69, then you can remove the links back. If you love our clean coding and great designs and decide to purchase one of our templates from our catalog, let us know and we will send you a $10 off coupon on your next purchase. I made the genealogy template for use on the USGenWeb Project County Sites or other free access genealogy county sites. If you have a county site, all you need to do is to email me and let me know what site you will be using the template on. I'll send it to you for free.